With stewardship of the environment and an engaging approach, we tell our clients’ stories, deliver unique, innovative and affordable solutions, maximizing our technical capabilities to bring a measurable return on our clients’ investments. "The potential for positive outcomes - from an environmental, sustainable, social, aesthetic and cultural perspective, it has the power to improve people's lives through the generations, in very direct and meaningful ways." "Seven years ago I began metalsmithing classes at the Stutz. Along with a variety of private shows I've had the good fortune to be invited to exhibit at events for Indianapolis Arts Council, Harrison Center and Indianapolis Museum of Contemporary Art." London, England - unparalleled history, culture, residential & commercial development, open space, green space, architecture. Embodies everything that makes urban centers great. "From my dad: 'It's not the mistakes you make, it's the grace to admit them, to do whatever it takes to fix them, to learn from them and move on." Joann Green is President and owner of Landstory. A registered Landscape Architect in Indiana, Joann has been a principal Landscape Architect with Landstory since 1992. Her 40 years of experience extends to a broad array of project types (parks, trails, streetscapes, urban revitalization plans, large scale industrial and institutional site design) for private and public sector clients on a local, state, regional and national level. Born and raised in Indianapolis, she holds a Landscape Architecture degree from Purdue University. Joann's previous experience involved project management and department head positions with two large A&E firms in Indianapolis. She takes pride in being involved with every Landstory project providing design and technical oversight, project management and on-going client communication. "Growing up in The Woodlands, Texas, most days were spent with my brothers exploring on our bikes through the natural timberland landscape. It wasn't until much later when I was introduced to Landscape Architecture that I understood why The Woodlands was special and that, as a landscape architect, I have the opportunity to create spaces that provide the feeling I experienced." "I have an affinity for 80's pop culture. Back to the Future, National Lampoon's Vacation, Nintendo, Dukes of Hazzard, Hot for Teacher, hypercolor tshirts, and Swatch watches." Chris attended Purdue University. He has gained valuable Landscape Architecture experience in the private and public sectors. Much of his work has focused on parks, trails, and streetscapes and design experience in the realm of public and private open space planning, master planned communities, and resorts. He's been involved in all stages of the design process including schematic design, design development and construction documentation. Chris takes pride in his technical ability, delivering our clients the highest quality documentation all the way through to implementation and construction completion. I believe Landscape Architects have the unique ability to bring a big idea to the table and see it become reality. We strive for the successful design by reaching that perfect balance of social needs, environmental opportunities and economic focus. As stewards we create total environments, culminating into great places for people. I was born and raised on our family dairy farm in Wolcott, Indiana. Shea graduated with a degree in Landscape Architecture from Ball State University in 2006. He moved to Atlanta, GA after graduation to work with HGOR, a landscape architecture firm, and joined Landstory in early 2014. Shea recently became a licensed/registered Landscape Architect in Indiana. Why he's passionate about Landscape Architecture. I've always enjoyed art and the ability to express myself through creativity. Landscape architecture gives me the opportunity to solve unique problems that are increasingly important in today's culture. One thing you didn't know about him. I grew up drawing cartoons so when we had career day in the fourth grade I chose to become a cartoonist. After my teacher suggested I pick another career, I chose to be an architect. So, from the fourth grade I've known I've wanted to become an architect. Graduated from Purdue University in 2014 with a BS in Landscape Design and Horticulture. Currently continuing my education at Ball State University to receive my masters of landscape architecture in 2019. Most experience is in landscape construction, herbaceous perennials and ornamental plants, and residential design and sales. "It has been a true pleasure working with Landstory... These projects were large in scope, incorporating architectural and landscape improvements, separated into phases, through a 30 year implementation period. All were finished on time and within budget... Each staff member was professional, practical and patient... There were challenges unique to each plan... which were handled with ease. The suggestions and concepts developed for each plan were excellent. The master plans were very well received and both communities expressed appreciation for the advanced planning. Landstory worked very hard to incorporate our suggestions and gave us a product which we are proud to display." "Landstory has served the City of Noblesville providing a variety of landscape architectural services for the last 5 years…their responsiveness, broad and creative talent and attention to detail is unparalleled. Joann Green's direct and consistent involvement in each of our projects has also proven invaluable." "Clark Dietz has a long standing and excellent working relationship with Landstory. I personally had the pleasure of working with them recently on the design and construction of a $2.6 million streetscape project for historic New Albany, Indiana. This project demonstrated their understanding of the critical balance between the engineering, Landscape Architecture and budgetary aspects of the project while creatively telling New Albany's story." "Landstory's work was exemplary and professional and I would not hesitate to hire them again. 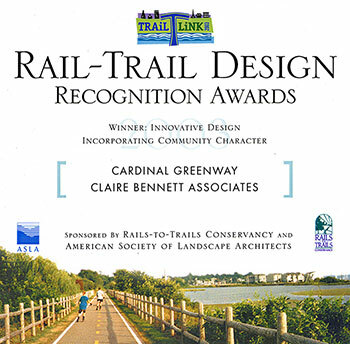 They were able to work with the design team, Trail committee, public and client seamlessly. They were also able to develop and implement a design that added significantly to the project."